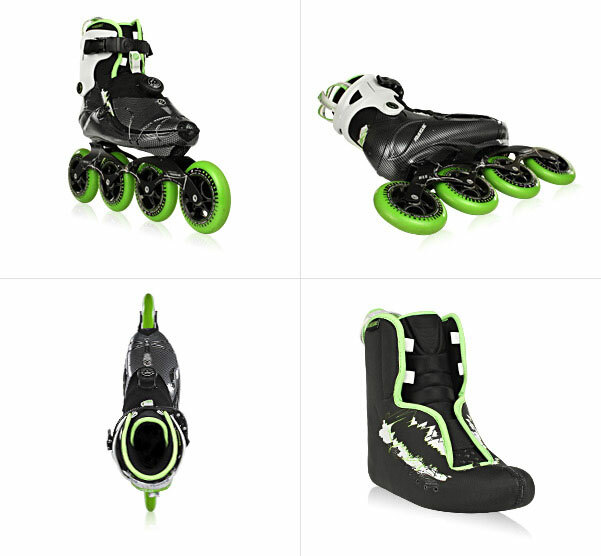 The new Powerslide Vi 100 Fitness skate with 4x110mm wheels and the aluminum frame a real racing machine. Allow to be comfortable inside the boat and its high Cuff hight have it in the longer distances as a super comfort. With the 360 ? ?° Lacing System you can fix the foot perfectly. The power load was developed by a world-class shoemaker and the world-class skaters Sergio Mc Cargo from Argentina. Maybe it's the best skate boot in terms of comfort and performance. The 360 ? ?° lacing system wraps the foot perfectly, thus ensuring an optimum fit in the boat. The boat will complete the walk so that no slippage occurs adjusted with bad blisters. The boat forged thanks to the 360 ? ?° lacing around your foot like a second skin. The simple tie shoelaces! The disc system is very easy to use and comfortable. The disc system makes it possible to find the perfect fit! The system uses strong and reliable. The built-in airflow system improves the air inside the shoe and thus increases the efficiency. High-tech foams can be adjusted with a heat of around 80 ° Celsius at the individual foot shape of individual skaters. This ensures greater comfort and performance. The one-piece 3-D-latex cushioning provides perfect comfort and perfect fit. It is anatomically shaped and fits perfectly to the foot of the skater, thereby guaranteeing a perfect fit and therefore better performance and more comfort. The mounting surface of this boat is a cross-frame as an "X". This "X" allows the skater, his boat race with the race track on his individual preference set. The typical and common alloying elements are copper, magnesium, Mangnese, silicon and zinc. The 7005 alloy contains more zinc and therefore, has a higher tensile strength than the 6000 aluminum which is very important in a race skate is part of the heat treatment for strength and rigidity. The skate is very small, please order it TWO sizes larger!